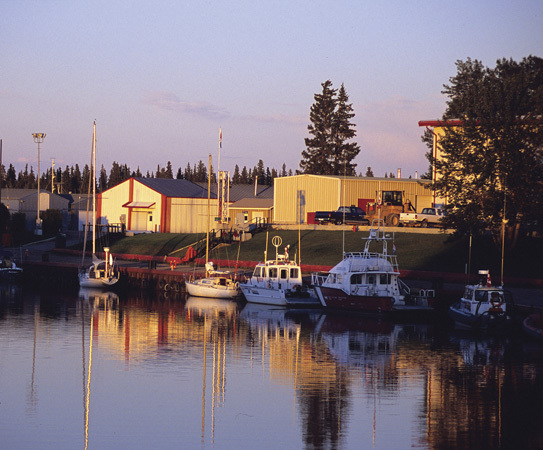 The Hay River area was originally a rich hunting and fishing ground for the Slavey Dene people who traveled up to the edge of Great Slave Lake each year and returned south before winter set in. In 1868, an Oblate Mission and a Hudson’s Bay Company fur trading post were established on Hay River. A small group of Slavey people led by Chief Chiatlo settled permanently at the location around 1890. An Anglican mission was built in 1893, followed in the early 1900s by St. Peter’s Church, which eventually included the residential school for the Diocese of Mackenzie, and St. Anne's Roman Catholic Church. The town and its missions were located near the centre of a 4000-kilometre inland water route that extended north of Edmonton from Athabaska Landing to the Arctic Ocean. This route was the main means by which the western region of the Northwest Territories was opened up to Euro-Canadian influence and development. Hay River remains an important barge port for the entire Mackenzie River system all the way to the Beaufort Sea. In 1939, a trail was opened from Grimshaw, Alberta to Hay River to supply the gold mines in Yellowknife, and the first cat trains were established to haul freight. This initiated the development of the commercial fishery on Great Slave Lake, and fishing families began to settle on Vale Island in the late 1930s and on the west channel in 1949. As part of the Canol Road project, the US Army Corps of Engineers built a runway on Vale Island during WWII, and by 1964 a rail line was extended from Grimshaw to Hay River to facilitate the zinc/lead mine in Pine Point on Hwy 5. Two Dene First Nations bands live near Hay River, providing a strong continuum of aboriginal culture and tradition. The West Point First Nations group is an independent community on Vale Island, where an original fishing village was located. Some of those first families still fish and live in the village today. The K’atl’odeeche First Nations Reserve is located on the east side of Hay River and is the only reserve in the Northwest Territories. Several festivals are hosted by these communities, including Treaty Day on June 11th, National Aboriginal Day on June 21st and the K’amba Winter Carnival at the beginning of March. The Dene inhabiting the vast reaches of the north all the way to the Arctic coast have a rich and diversified culture, which has been preserved for thousands of years in their strong oral traditions and lifestyle. The Dene Cultural Institute, or Yamozha Kue, works to continue this heritage and to share it with others. The building was designed on the advice of Dene elders and is based on the legends of Yamoria, an important figure in Dene history. The Hay River Heritage Centre, located in the old Hudson’s Bay store on Vale Island, offers exhibits which capture the rich natural and human history of the region. Traditional fiddling and jigging contests are held at the Metis Friendship Centre and Soaring Eagle Friendship Centre. Part of the Trans Canada Trail system, Hay River has a network of more than 20 kilometers of trails offering scenic vistas of the river and interpretive signage on natural and cultural history. Fishing on the Hay River begins shortly after the ice moves out, peaks in mid-June and lasts all summer. Walleye, northern pike and the feisty Arctic grayling are a common catch. Fishing on Great Slave Lake is almost year-round, only stopping in late fall until the lake has frozen over when nets are cast beneath the ice to capture the haul. While the lake is well known for its trophy lake trout and whitefish, there are also great stocks of goldeye and inconnu. During the spring, summer and fall, excellent fishing opportunities exist right in town. Cast from shore, rent a canoe for a leisurely paddle down river or embark from Vale Island at the Porritt Landing boat launch. With Great Slave Lake as base camp, the abundance of lakes and rivers in the entire South Slave Region may be thoroughly explored. Outfitters offer guided fishing tours on Great Slave Lake, to the legendary East Arm and other remote locations. 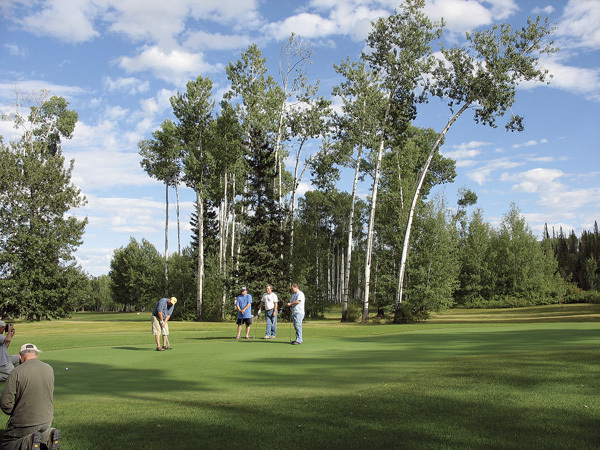 The Hay River Golf Club is a beautiful 9-hole course that has been carved out of the boreal forest and hugs the edge of picturesque Hay River. The well-maintained grass course and artificial grass greens will challenge any golfer. In the winter, the golf club transforms into the Nordic Ski Club, which offers several events and races throughout the season, with many kilometers of groomed trails for cross country skiing and snow shoeing, well lit for nighttime excursions. The Hay River snowmobile club provides maps for snowmobile exploration throughout town and in the forest along wildlife trails. Hay River is situated directly in the Aurora Borealis viewing belt, with spectacular displays of Northern Lights commonplace between mid-August and October and again in February and March. An estimated one trillion watts of power are generated by the collision of solar winds and the earth’s magnetosphere, hovering as little as 60 miles above the North Pole. The native Dene metaphysical explanation is that the power and beauty derive from the presence of spirits. Tourists are offered accommodation and dining at several hotels, inns, bed and breakfast establishments and restaurants in Hay River. 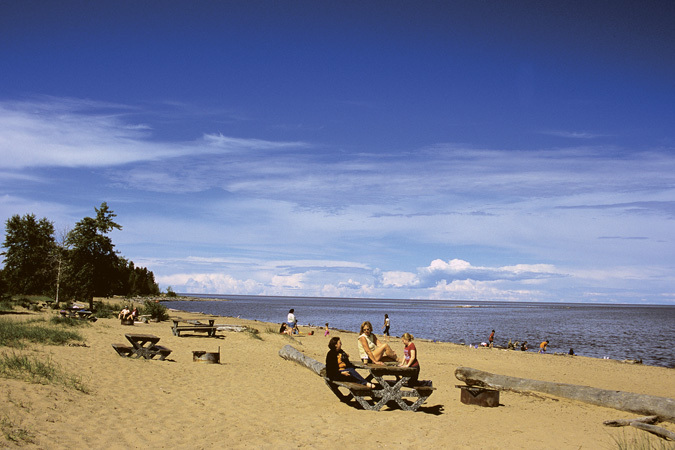 The area is a camper’s paradise with two facilities for RV and tent camping within town on Vale Island at the Hay River Territorial Park near the public beach, and 10 electrified RV stalls at the Hay River Golf Club. Camping in the surrounding forest is accommodated at the following campgrounds: Twin Falls Gorge Park 30 miles south of Hay River at Louise and Alexandra Falls, Lady Evelyn Falls Park near the community of Kakisa and Little Buffalo River Territorial Park on Hwy 6 toward Fort Resolution. A short distance west of Hay River, Kakisa River and McNallie Creek Falls are among the numerous Day Use facilities located along Hwy 1. 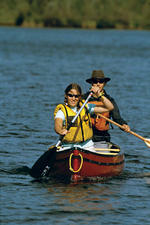 Most are maintained by the government and located in areas with historical significance. Hay River celebrates the long days of summer with Hay Days Festival in early July. The festival features workshops, culture, art, food and music culminating with a Saturday night shaker, a ‘wet event’ on the shore of Great Slave Lake featuring live bands into the early hours of the morning. The Fisherman’s Wharf is a popular meeting place on Saturdays from mid-June to September where locals and visitors can buy artisan crafts, vendor products and locally caught whitefish served with chips. 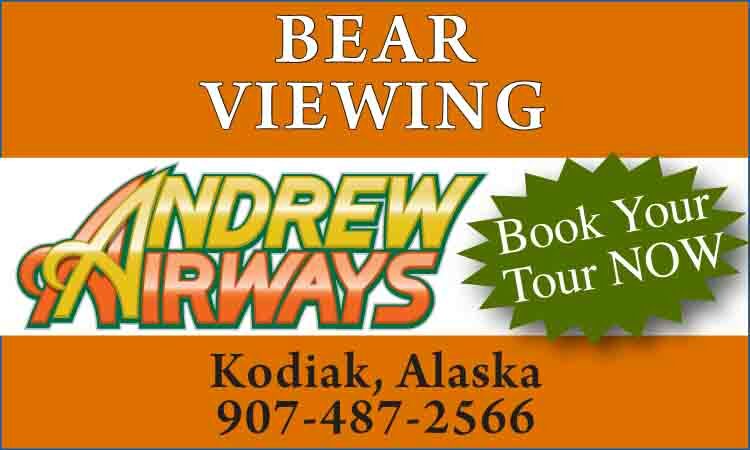 In winter there is also much to do with the Aurora Ford dog sled race, polar pond hockey tournament, Rotary wine festival, figure skating ice carnival, Ptub x-country ski race and much more. 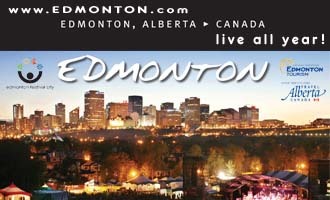 For a listing of festivals and events throughout the year, visit the Town’s website at hayriver.com.